Mud logs enable the geological description and analysis of rock cuttings suspended within the returned drilling mud and can provide a variety of useful information regarding reservoir parameters. "Mud logging is the analysis of the drilling mud that has been cycled down the borehole and returned to the surface during drilling operations. The drill mud carries rock fragments from the bottom of the borehole and these rock fragments are used to determine the downhole lithology. A mobile laboratory is set up near the drilling rig so that mud logging can give close to real time data of the lithology and borehole fluid during a drilling operation. Mud logging is also important for monitoring the drill fluid volume so the drill operator knows if fluid is being lost to a formation. Mud logging is a standard practice during drilling operations and normally a third party mud logging company is hired to perform the task." cannot be used as a page name in this wiki. Mud logging is the analysis of the drilling mud that has been cycled down the borehole and returned to the surface during drilling operations. The drill mud carries rock fragments from the bottom of the borehole and these rock fragments are used to determine the downhole lithology. A mobile laboratory is set up near the drilling rig so that mud logging can give close to real time data of the lithology and borehole fluid during a drilling operation. Mud logging is also important for monitoring the drill fluid volume so the drill operator knows if fluid is being lost to a formation. Mud logging is a standard practice during drilling operations and normally a third party mud logging company is hired to perform the task. Mud logging is common practice in geothermal drilling. It is important for geologic monitoring and lithological record keeping. Samples from the drilling mud are taken at predetermined intervals. The samples are taken to the onsite laboratory and the drilling mud is separated from the drill cuttings. The drill cuttings are dried and viewed under a microscope then geologic descriptions are written up describing the lithology of the cuttings. Drill cuttings are often displayed in order of depth they were received from so that the change in lithology relative thickness of strata can be viewed and documented. Mud logger collecting a sample. Example of a mud log. Mud logging is standard practice during drilling operations and is important for documenting the geology that a well passes through. Preserving and storing the rock cuttings in an organized filing system is normal procedure. -The depth that the rock cuttings originated from is not always 100% accurate. Calculations can be made that determine the time it takes for the drill cutting to reach the surface, this is called “lag time”. Some assumption have to be made in the calculations because not all rock cuttings are the same size and density so there can be some error in calculating the depth that the cuttings originated from. -A small degree of mixing occurs in the mud before it reaches the surface, so the rock cuttings in a particular sample may a mixture of cuttings from a range of depths. -Contamination can sometimes be a problem when making interpretations of samples. There can be metal contaminates in the drilling mud from fragments of the drill bit or drill string. 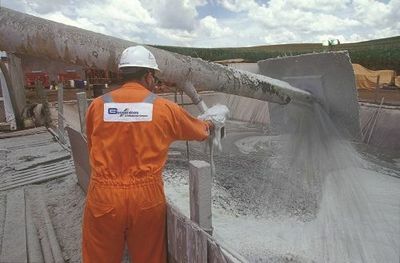 Cement from well casings may get into the drilling mud. Sometimes different materials may be mixed into the drill mud to help loss of circulation and these can sometimes be misinterpreted as mica flakes, calcium carbonate, or various other minerals. This page was last modified on 24 October 2013, at 11:01.